The purpose of your re sume is to get you an interview with your potential employer. In addition, once you are invited for an interview, the recruiter will almost certainly use it to find out more about you. Especially if you have less professional experience or no work history at all, your reader will most probably be interested in your educational background. 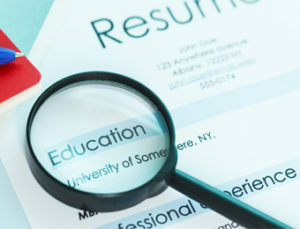 If you are still studying, just graduated, or have been out of school for less than three years, your education information should be at the top portion of your resume. If you have not been studying and been unemployed longer than three years, it needs to be placed at the bottom. The longer you have been out of school, the shorter your education section should become. If you have been idle from school and have not accumulated impressive work experience, you may consider keeping your education section at the top for a couple more years. But it would be more prudent, of course, to consider garnering more work experience to strengthen the overall effect of your resume. Just be mindful of what specifications are involved in the types of jobs for which you apply. If there is one skill you gained, a specific course you took, or some training you undertook during school that is relevant to your job search, you should definitely add them to the education section of your resume. If you are a recent graduate, your resume should have one to two pages. You can have several pages if you many internships throughout school at a broad range of employment venues and if you did a vast array of career-specific duties other than filing, answering phones, and buying birthday gifts. Even if this is true, you should consider editing your resume per search and only include relevant duties done. Moreover, even professionals with more than 20 years of experience can have a one-page resume because hiring nowadays is becoming quicker, yet tougher. Of course, every recruiter or employer is different personality-wise and works under different professional and personal conditions from day to day. But if he or she has a stock of resumes to skim in a short period of time, your one-page resume will more than likely be better appreciated. Marie Edwards holds a senior executive post for a reputable recruitment agency.